Property tax account must not be in arrears. Payment in the exact amount of the interim and final installments is withdrawn directly from the property owner’s bank account on the due dates indicated on the Tax Notice. There are four installment due dates in a calendar year: the 25th day or next Business Day of February, April, August, October. First enrollment date: prior to January 10th or next Business Day of a given year. No penalty/interest added as paid by due date unless a payment is NSF. The Tax Notice mailed by the Municipality a minimum of 21 days in advance of such due dates serves as the pre-notification of the amounts to be withdrawn on each of the four installment due dates. This plan is based on equal monthly payments dependant on the enrollment date. Equal payments are calculated at time of enrollment and recalculated once a year upon issuance of the Final Tax Notice in August. The first seven (7) payments (January to July) will be equal monthly payment amounts based on the total of the prior year’s property taxes. The next five (5) payments (August to December) are adjusted to reflect the current year’s tax amount, less the payments already made in the current year. This installment amount would then continue until July of the following year when the amount is recalculated again in August. Agreement forms are accepted throughout the year. For forms received by the 10th day or next Business Day of a given month, the payment will be included on that month’s Withdrawal Date. Forms submitted after the 10th day or next Business Day will be included in the next month’s Withdrawal Date. The Withdrawal Date is the 25th or next Business Day of each month. For Agreement forms received prior to July 10th, the calculated monthly payment will be based on the prior year’s annual tax amount less amounts paid to the date of enrollment. For forms received after July 10th, the calculated monthly payment will be based on the current year’s annual tax amount less amounts paid to the date of enrollment. No penalty/interest added unless a payment is NSF. There are no discounts credited for payments made. Upon enrollment in the Plan, the taxpayer shall be notified in writing of the monthly payment. The Final Tax Notice mailed by the Municipality a minimum of 21 days in advance of the monthly Withdrawal Date serves as the pre-notification of the amounts to be withdrawn after initial enrollment. If there are any additional changes to the monthly payment other than what is shown on the Tax Notice, the property owner will be notified in writing of the amounts by the 10th day or next Business Day in advance of the Withdrawal Date. For property tax accounts in arrears. Property owner must enter into an acceptable payment schedule with the Treasurer. Agreed upon monthly payment withdrawn from property owner’s bank account on the 25th day or next Business Day of each month. Penalty/interest will be added based on existing policy and legislation. Interim, Final and Supplementary (if applicable) Tax Notices will continue to be issued. Once the account is paid to date, the property owner may choose to enroll in the Installment Due Date or Monthly Plan options. Pre-authorized debit is eligible for payment of property taxes only. Property owner’s tax account must be current and in good standing for enrollment in installment or monthly plans options. Accounts where the property taxes are paid by a mortgage company are not eligible for enrollment. Pre-authorized debits to be drawn only on Canadian financial institutions in Canadian funds. 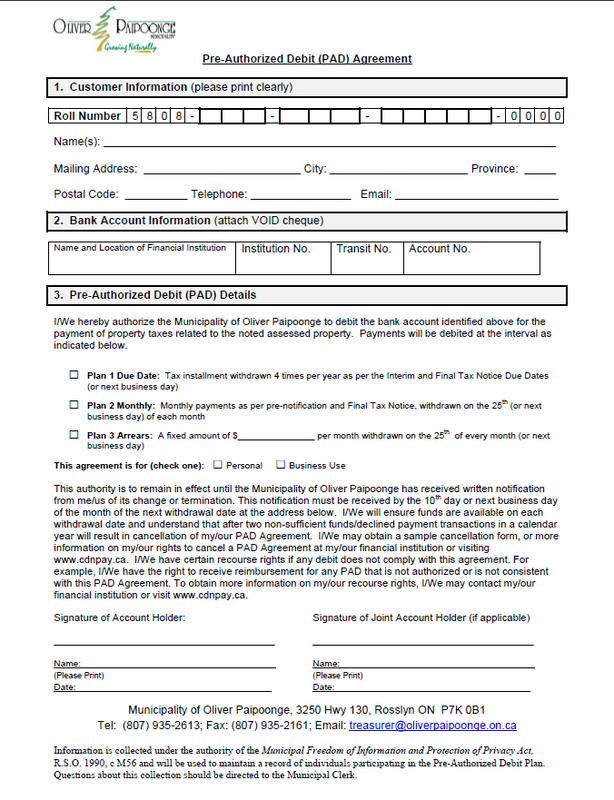 The property owner must complete and sign a Pre-Authorized Debit (PAD) Agreement indicating choice of Plan based on eligibility. Should more than one signature be required on cheques issued against the account, all signatories must sign the application. A VOID cheque must be attached to the enrollment form. A non-sufficient funds (NSF) charge will be levied for any payment that does not clear the account. The unpaid taxes as a result of a NSF shall be subject to penalty if overdue. The plan shall be terminated if two (2) payments are returned due to non-sufficient funds in a calendar year and the property owner must pay the balance as is due. The withdrawal date is the 25th day of the month or the next Business Day.